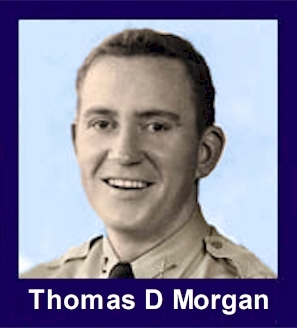 The 35th Infantry Regiment Association salutes our fallen brother, 1LT Thomas Davis Morgan, O-2017887, who died in the service of his country on November 19th, 1951 in Kumhwa, North Korea. The cause of death was listed as MIA to KIA. At the time of his death Thomas was 27 years of age. He was from Denver County, Colorado. Thomas' Military Occupation Specialty was 2622-. The decorations earned by 1LT Thomas Davis Morgan include: the Combat Infantryman Badge, the Distinguished Service Cross, the Purple Heart, the National Defense Service Medal, the Korean Service Medal, the United Nations Korea Service Medal, and the Republic of Korea War Service Medal. First Lieutenant Morgan was a member of Company I, 3rd Battalion, 35th Infantry Regiment, 25th Infantry Division. He was Killed in Action while fighting the enemy in North Korea on November 19, 1951. His remains were not recovered. For his leadership and valor, First Lieutenant Morgan was awarded the Distinguish Service Cross, the Purple Heart, the Combat Infantryman's Badge, the Korean Service Medal, the United Nations Service Medal, the National Defense Service Medal, the Korean Presidential Unit Citation and the Republic of Korea War Service Medal. The President of the United States takes pride in presenting the Distinguished Service Cross (Posthumously) to Thomas Davis Morgan (0-2017887), First Lieutenant (Infantry), U.S. Army, for extraordinary heroism in connection with military operations against an armed enemy of the United Nations while serving with Company I, 3d Battalion, 35th Infantry Regiment, 25th Infantry Division. First Lieutenant Morgan distinguished himself by extraordinary heroism in action against enemy aggressor forces in the vicinity of Kumhwa, Korea, on 19 November 1951. On that date Lieutenant Morgan led his platoon in an attack against a numerically superior hostile force occupying heavily fortified hill positions. As the friendly force advanced toward their objective, they were subjected to a heavy volume of small-arms, automatic weapons and mortar fire. With a total disregard for his personal safety, Lieutenant Morgan moved through the devastating fire, fearlessly directing his the fire of his men and constantly urging them forward. When the advance was halted by a stubborn group of enemy soldiers firing a machine-gun from an almost inaccessible bunker, Lieutenant Morgan unhesitatingly moved across the fire-swept terrain and single-handedly neutralized the bunker and took three prisoners. During this courageous assault he was painfully wounded, but he refused to leave his men. Instead, he directed the men holding their positions against the hostile force which was preparing to attack in an effort to drive the platoon from the hill. In a heavy mortar barrage which preceded the hostile attack, Lieutenant Morgan was again wounded. At this time several of his men offered to brave the enemy fire in order to evacuate him. Not wishing to endanger the lives of his men, Lieutenant Morgan ordered them to fall back to more tenable positions without him. He was last seen occupying a forward emplacement, still shouting directions to his men as they withdrew. In the hostile attack which followed, this position was overrun by the numerically superior enemy.